Park Prep Academy follows a philosophical guideline known as The Bank Street Developmental Interaction Approach. A graduate of Bank Street’s Graduate School of Education, Park Prep Academy Director, Justine Wanat, spearheads a comprehensive and continuous training program to ensure that the entire faculty at Park Prep Academy is well-versed in the practices and beliefs of the Developmental Interaction Approach. Development unfolds at different times for different children. Since it does, however, occur on a continuum, teachers choose topics that they know from research and practice will engage and challenge children in a particular range of development. First, they decide what the organizing concepts, or big ideas, are, and then they design experiences that will lead children to make discoveries about those ideas. As the curriculum unfolds, it is common for children to bring questions and contributions to the class that the teacher recognizes are important. An individual student, a small group, or the whole class may lead the experience in a new direction. In this way, accumulated knowledge from the past and present is constantly being examined and reconstructed with fresh ideas and inquiries in a collaboration among the teacher, faculty, parents, and students. 1. Developmental interaction regards the young child as a maker of meaning who is actively engaged in making sense of the world. 2. Play is seen as important and meaningful work. 3. The child’s emotional experience is the key to growth. 4. Social interactions are of major importance. 5. 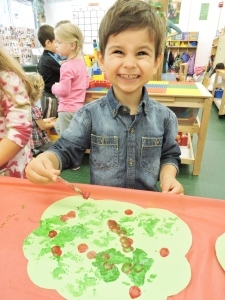 Motivation and curiosity are piqued through the exploration of open-ended materials such as: water, sand, clay, blocks, puzzles, art materials, and more. For more information on Bank Street College of Education’s Developmental Interaction Approach, click here. Retrieved from http:// www.bankstreet.edu.